So we are very excited that we have a new, customised library in our house - which comes in the shape of a very unique tree! If you haven't read all about it, check out the tour of our study here. Just so you know, we started our firstborn on bedtime reading before she turned two years old and made it a daily routine. It was a time that she would look forward to every night and one that gave us ample opportunity to bond and learn at the same time. 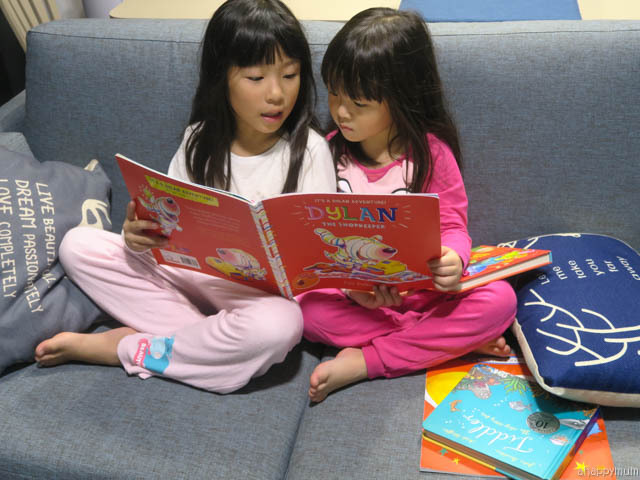 I have to say that the efforts have definitely paid off because not only has she developed a very strong love for books, she can now read proficiently and even take over my role as the storyteller when it comes to reading to the younger ones. If there's one thing we don't mind having more of and find it very hard to part with, it's BOOKS. Yes, books mean knowledge to us and seeing how they can be passed down from one kid to the next, it's not surprising to say that our library has only grown, not diminished, over the years. In today's post, I'm sharing with you some of our latest additions to the library. If you are looking into building up your library too, I have a giveaway at the end of the post too, so read on! 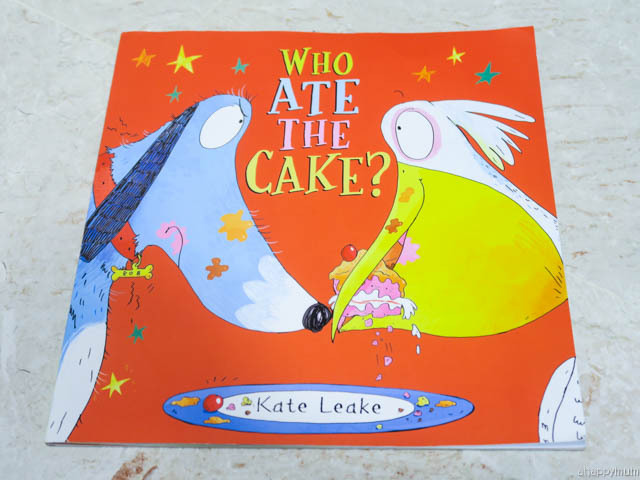 Who Ate The Cake is a hilarious story about a boy who loves to collect odd items, a dog who gets blamed for things he didn't do, and a pelican who eats just about anything. It becomes a mayhem at home when the family members start to lose their stuff and Bob the dog decides that enough is enough when the pesky pelican gets him into nothing but trouble. 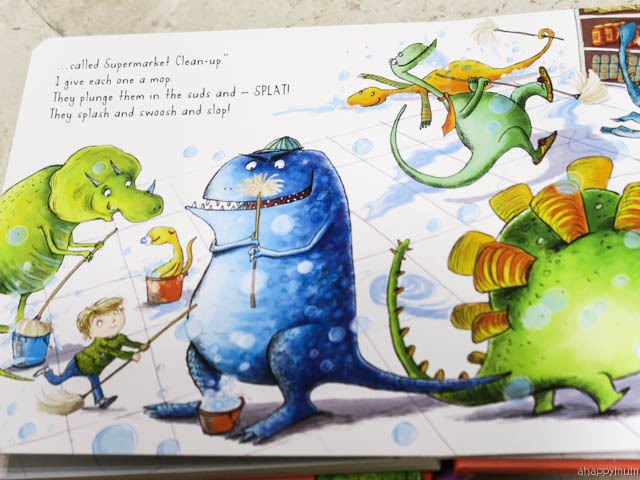 We love the bright, striking illustrations in the book, including even the finest details, that help to make the story come alive. 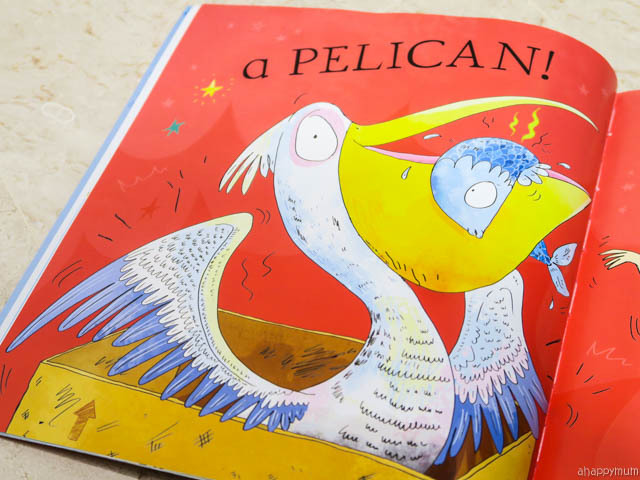 My favourite page was when they 'unpacked' the pelican's beak and found a whole lot of weird stuff in it, including a tea set, soggy pastries and something half knitted. 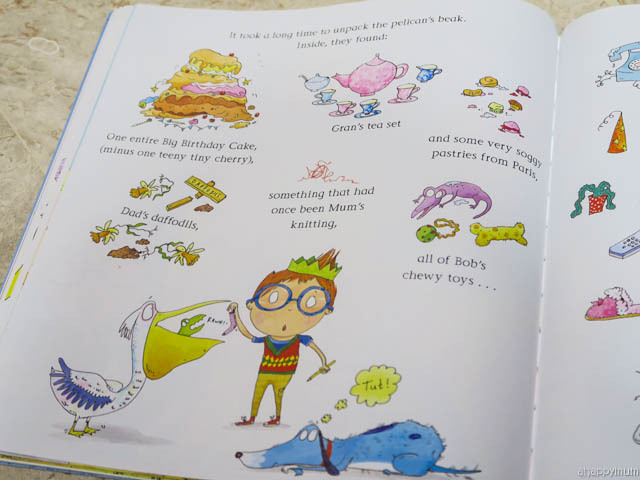 Entertaining and full of mischief, this book makes for a light-hearted read and is suitable for kids aged 4 to 8. My kids love to play pretend and one of their favourite 'occupations' is being the cashier. They like to run around with the till, imagining that one of them is the customer and the other the cashier, and then proceed to buy everything they see. 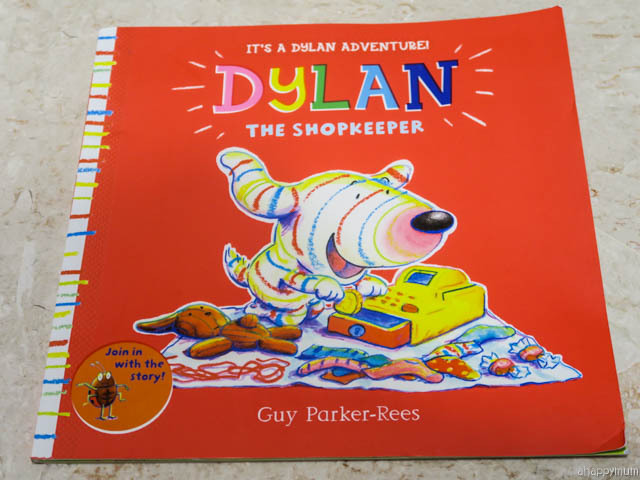 So you can probably sense their thrill when they read about this book with a main character who dreams to become a..... shopkeeper and goes around with his till and a bunch of odd items that he wants to sell. 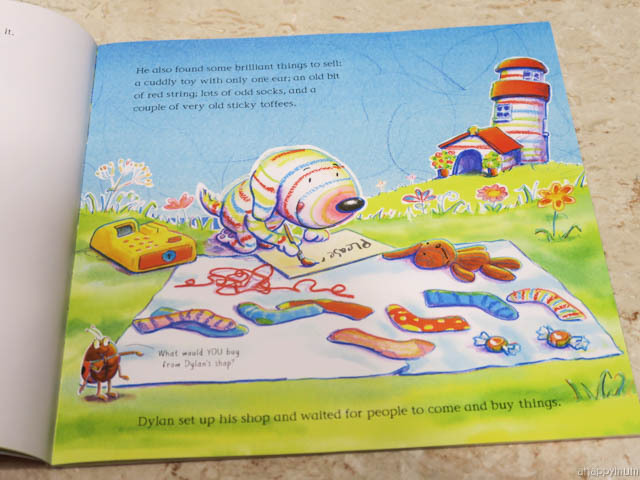 This is our first book in the Dylan series and I must say we are loving his cute, bubbly character, his love for his friends, his infectious enthusiasm and his adorable rainbow stripes. The illustrations are visually appealing and the vibrant backdrop helps to make the characters stand out while giving depth to the story. 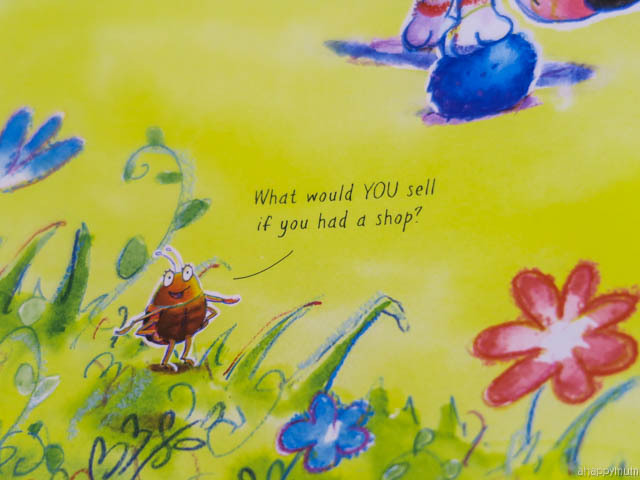 One special part about the book is how you can spot this friendly ladybird who will be asking you questions so that you can put on your thinking cap and join in the story too. For instance, he asks about what you would sell if you had a shop, whether you can run fast and makes you follow the marching ants with your finger too. The ending to the story is an unexpected but happy one and I love how it stresses on the importance of friendship. It teaches you to never abandon your friends in times of trouble and how you can make sacrifices to help a friend in need too. 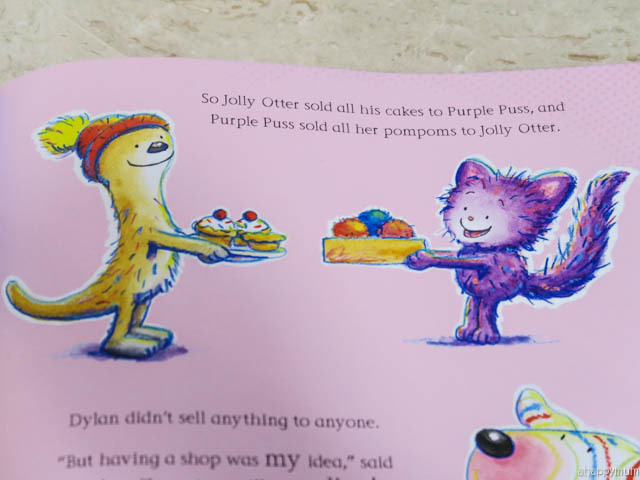 Beautiful illustrations to accompany an engaging plot, this is a heartwarming read for kids 5 and up. Who loves dinosaurs? Yup, almost all kids, I think. I've hardly met one who dislikes dinosaurs or has no interest to learn anything about these extinct creatures. 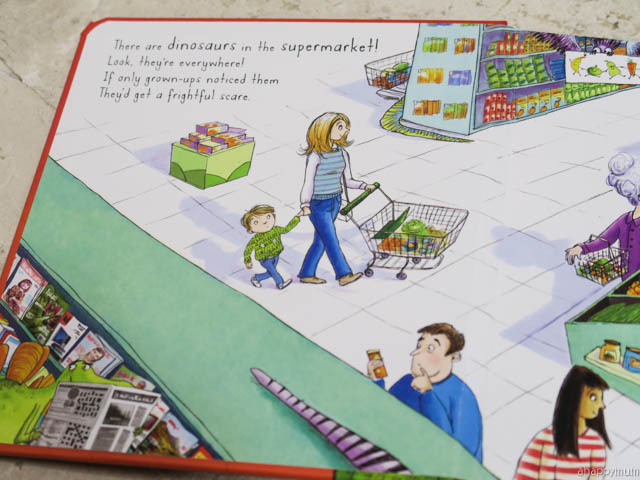 Dinosaurs in the Supermarket is a book about fun-loving, mischievous dinosaurs who like to hide around the supermarket and jump out to say "Boo!" 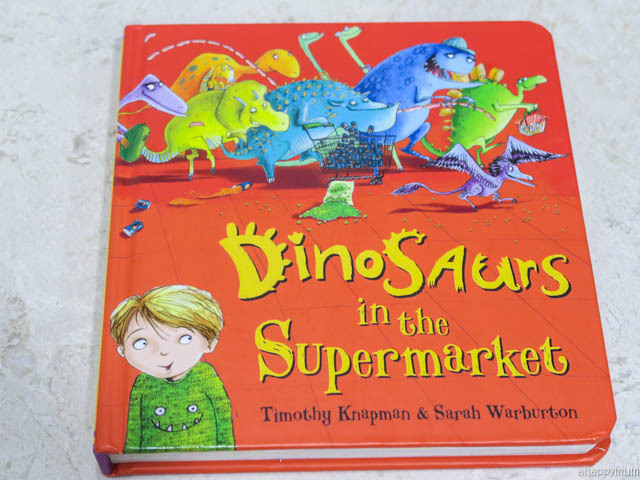 The kids adore this book because they are on a special task every time they read it - to locate all the dinosaurs by spotting parts of their bodies! Yes, you get to find all their hiding places and even though we've read this umpteen times, the girls never get tired of it and will always take turns to find the dinosaurs until every single one has been pointed out. So, while you learn about some dinosaur species, you also get to play hide and seek with them. Pretty cool, right? 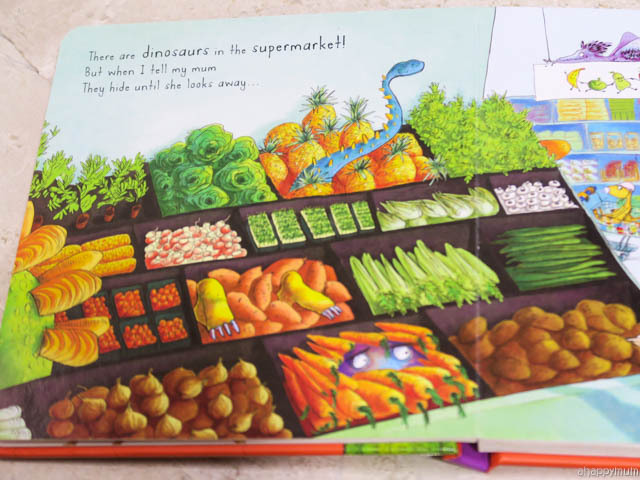 The story is also very creative - I mean, really, dinosaurs in the supermarket? - and I love how the boy comes up with a clever idea to get the dinosaurs to play a game and come out of hiding so that the grown-ups can finally believe his words. Exciting to read and fun to play, this book is a keeper and will be a hit with young children aged 3 to 7. This book is our favourite of the lot and now makes it as one of the most popular ones in our library. 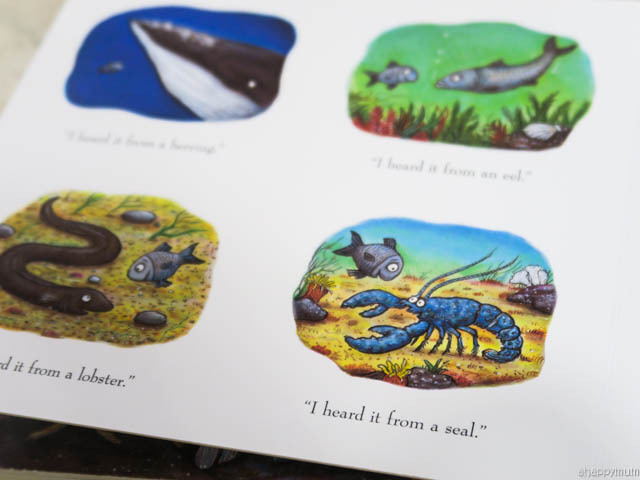 Yes, we simply love Julia Donaldson's books - the kids can't get enough of Gruffalo or Gruffalo's Child - and it gets even better if accompanied by Axel Scheffler's brilliant illustrations. 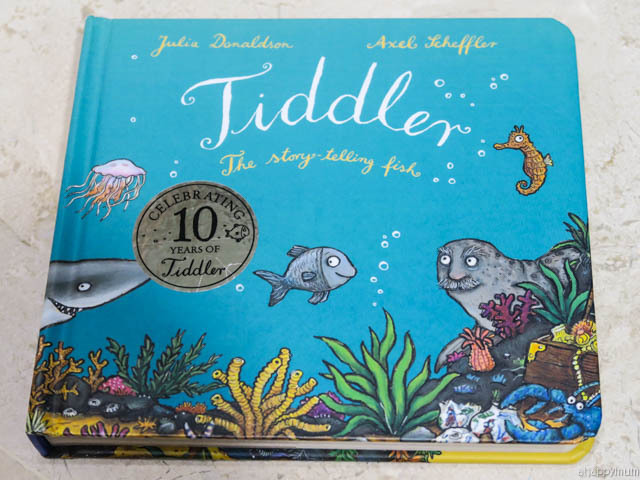 The story takes place under the sea and revolves around a story-telling fish named Tiddler who was a small fish with a big imagination. He told the tallest tales and no one believed them except for his friend Little Johnny Dory who really loved these stories. 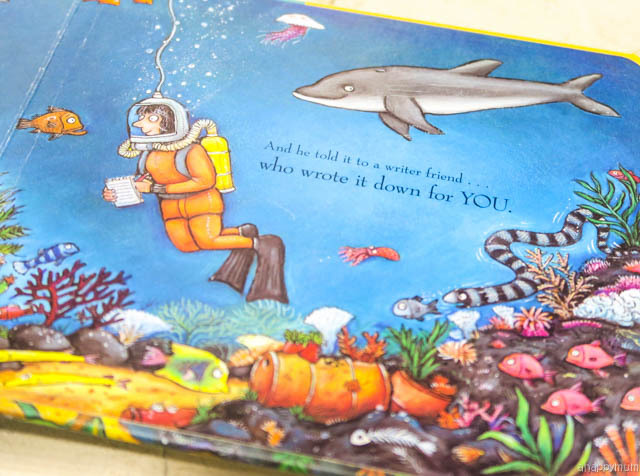 The twist came one day when Tiddler was caught in a net and ended up being lost in the middle of the ocean. Can you guess how he managed to make his way home eventually? Yes, by tracing and following his tales which have spread far and wide across the waters! Who would have thought that they could one day be his lifesaver? 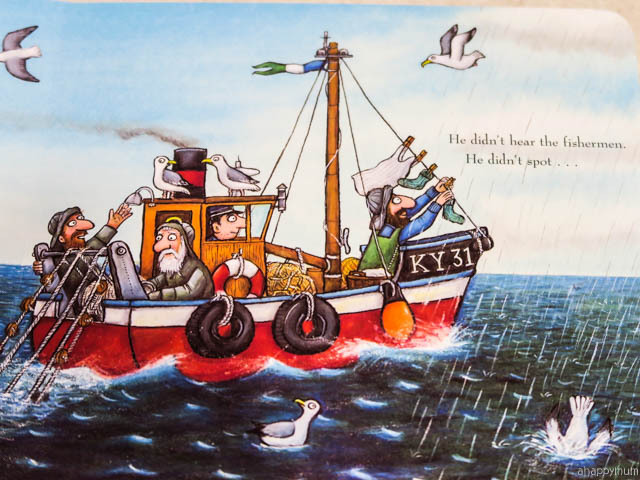 As usual, we love Julia Donaldson's clever use of rhyming words which make the book so interesting and fun to read. 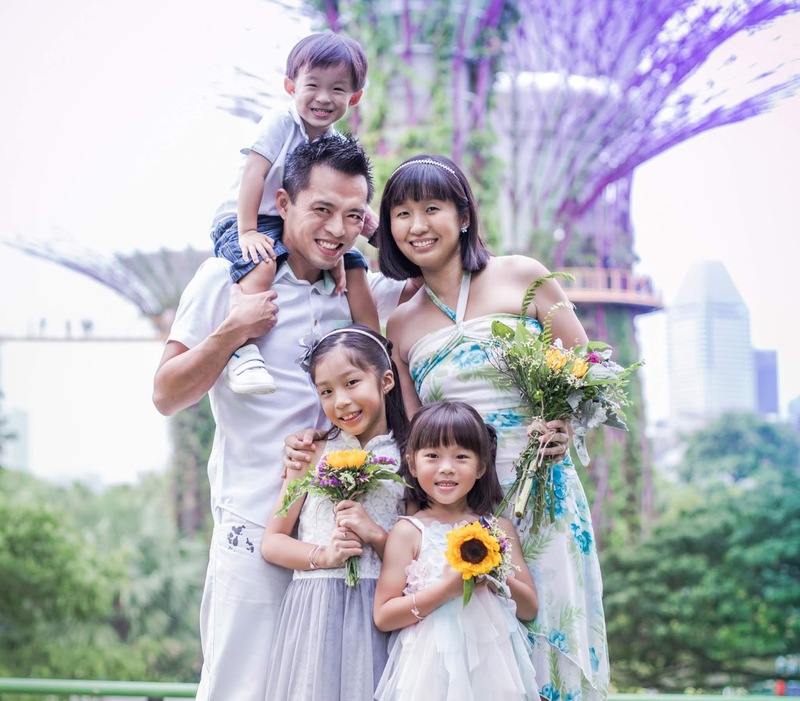 Four-year-old Ariel, who is now slowly learning to recognise and read words, was able to memorise at least half the book because of the catchy words and captivating plot. 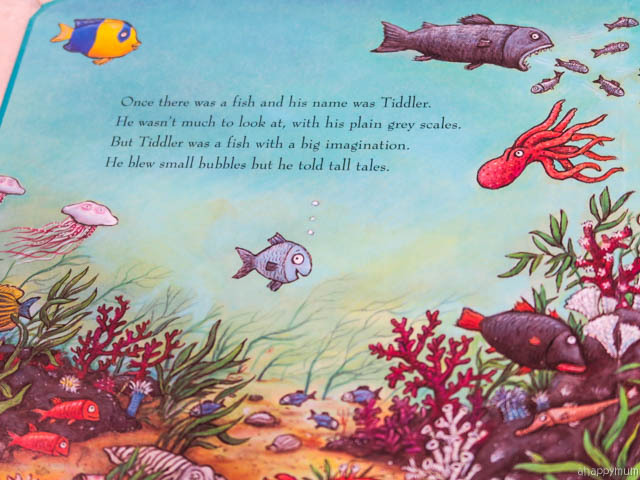 Axel Scheffler is also one of our most-loved illustrators and he did such an awesome job for all the marine life, which includes dozens of fishy characters, and even Julia Donaldson herself appears in the ending in the most creative way. Yes, I'll be a spoiler and show it to you because I need you to see how cute this is! 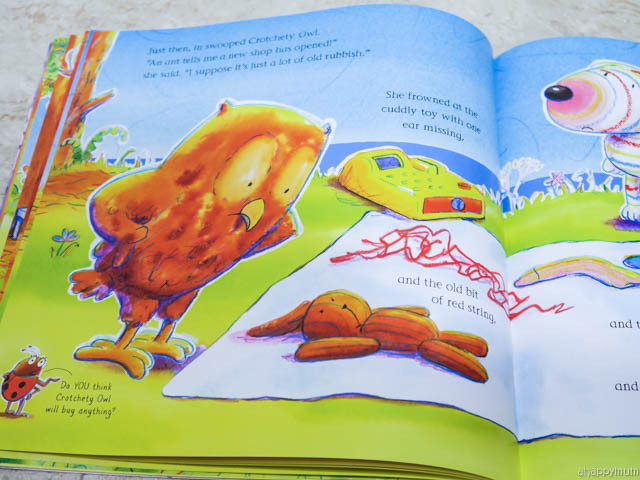 The book is certainly a delight to read and recommended for children of all ages. In fact, I myself love reading it so much to my kids too and it's one of the very rare books that I don't mind doing it over and over again, which says a lot about the power of this amazing author. For those of you who would love more books for your library, good news! 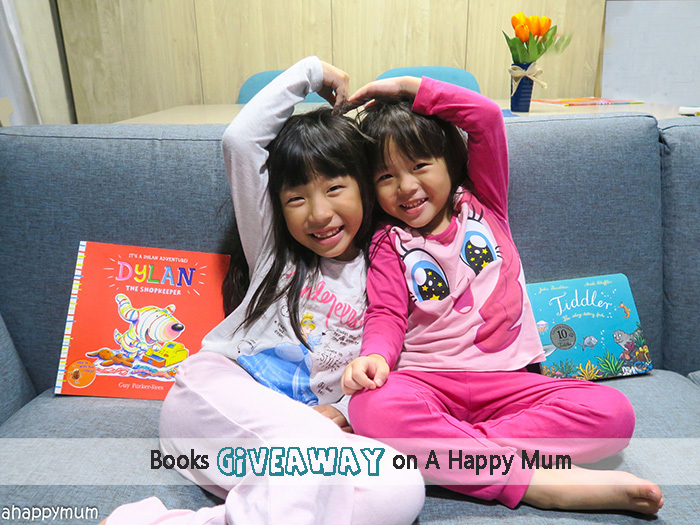 A Happy Mum is giving away two bundle sets of Dylan the Shopkeeper and Tiddler! This giveaway takes place on Facebook and Instagram, and one winner will be picked from each platform. 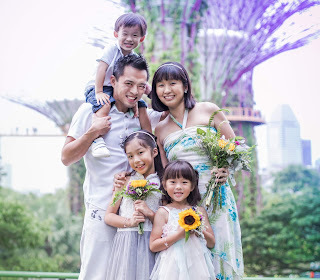 To join, hop over for more details at my Facebook page or check out Instagram @ahappymum. This giveaway ends on 24 May 2359hs. Winners will be randomly picked and announced on the respective social media platforms and via direct messages. They will have 48hrs to reply or new winners will be picked. This giveaway is in no way sponsored, endorsed or administered by, or associated with, Instagram or Facebook. Disclosure: We received the above mentioned books from Pansing for review purposes. All opinions and photos are our own.